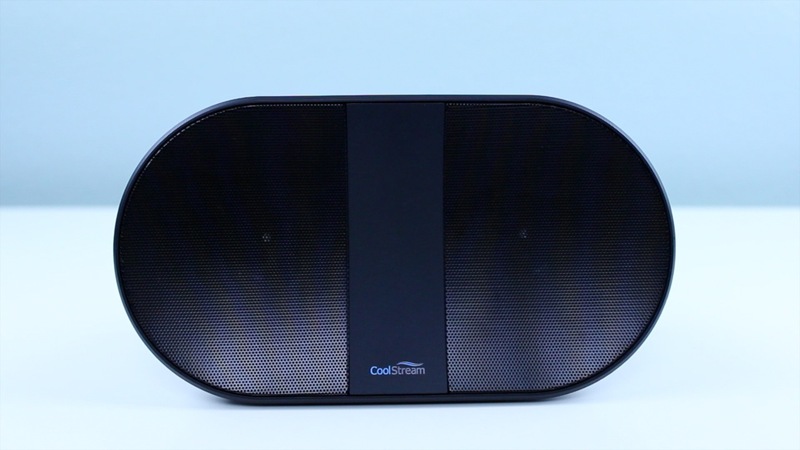 CoolStream is a fairly new company and the bluetooth speaker market is a bit crowded. Not too long ago CoolStream introduced its first bluetooth speaker, how does it stack up to competition? Let’s go ahead and get started. Looking around the box you can see here that this is a bluetooth speaker that you can use just about anywhere. It isn’t water proof or a complete rugged device, but it’s definitely tough enough to take around with you. The first thing we’ll see is the speaker itself which is inside of this nice little packaging. At first glance it definitely looks really classy and has a nice curve to it. Digging deeper into the box we’ll see a generic quick start guide which gives some more info on how to use the speaker and also tech specs. Next, we’ll find a usb cable and also an auxiliary cable. Looking around the speaker it’s definitely very stylish and nice to look at. On the front we can see the dual stereo speakers which sound surprisingly good, and we can also find some CoolStream branding which isn’t too intrusive. At the top of the speaker we can see all our buttons which includes the power button, phone button for answering and ending calls, mode button which we’ll talk about in a minute, and of course our generic back, pause, and more. The mode button is definitely useful because it allows you to sort through all the different inputs. For example, you may have the speaker connected over bluetooth, sd card, and also an external drive. The mode changes colors depending on the different device it’s connected to. Towards the back we have ourselves the usb 2.0 port, sd card slot, which can take a card with up to 32 gigabytes of storage, and last but not least, the DC-in jack which is used for charging. As you may have already noticed, it doesn’t take a micro usb port which is a bit of a disappointment. According to CoolStream it should take about two hours to charge up the speaker, but when using the device I found that it took about two and a half hours for a full charge. In regards to battery life it lasts about four hours which isn’t great, but it’s definitely good enough for my use. One thing I really like about the speaker is that it has these little rubberized feet that will keep the speaker from sliding around. I’ve noticed that other speakers don’t always have this basic feature which is definitely a must have for around the house use. Moving on, the bluetooth connection worked flawlessly and I didn’t have any issues with changing songs, pausing music, or anything. Overall, the CoolStream Bluetooth Speaker is definitely a little expensive for $60, but it does have a ton of functionality. I’ll have a link down in the description box to where you can pick up the device and also our full written review over at GadgetGuruHD.com . If you enjoyed this video be sure to give the video a thumbs up and check out the rest of our content. Thanks for watching everyone and we’ll catch you all in the next video.